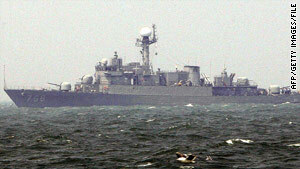 The South Korean navy corvette Cheonan, similar to this ship, sunk after an explosion, Yonhap News Agency reports. (CNN) -- A South Korean navy ship sank in the Yellow Sea near North Korea late Friday, and the navy shot at an unidentified ship toward the north, according to reports quoting South Korean government officials. Yon-hap News Agency quoted Navy officials saying Friday that a ship carrying 104 crew members sank off the Seoul-controlled island of Baengnyeong in a flashpoint maritime border area between the Koreas. The 1,500-ton Cheonan went down at 9:45 p.m. near the island, but the cause of the incident was not immediately known, the officials said. South Korean President Lee Myung-bak ordered a "quick and thorough" investigation Saturday into what caused the ship to sink, keeping in mind "all possibilities," his office said, according to Yonhap. A rescue operation was under way, with the Navy telling Yonhap it had rescued 58 crew members but it feared others may be dead. The South Korean government issued a statement saying the reason for the incident remains unclear, but it wasn't ruling out some sort of military engagement. An explosion had occurred in the rear of the ship, leaving a large hole in the ship's underwater hull, officials told Yonhap. A U.S. State Department spokesman said Friday that there was no evidence North Korea was behind the incident. "Let's not jump to conclusions here," said the spokesman, Philip J. Crowley, when asked about possible North Korean involvement. "I'm not aware of any evidence to that effect, but I think the authoritative source here would be the South Korean government." Yonhap quoted South Korean naval officials as saying a South Korean vessel fired at a ship toward the north later. However, South Korean government officials said it isn't certain whether North Korea was involved in the incident. Yonhap said local residents reported hearing gunfire for about 10 minutes. As a result of the incident, South Korean government officials held an emergency meeting of ministers handling security-related matters, officials told Yonhap. South Korea's Korean Broadcasting System said Navy vessels and helicopters were rescuing crew members, some of whom reportedly jumped into the sea after the blast, the KBS report said. The official said the Sockcho, another South Korean navy vessel patrolling nearby, fired at unidentified ships north of the area. U.S. military officials told CNN a South Korean vessel sank. North Korea has said recently it is bulking up its defenses in response to recent joint South Korean-U.S. military drills, Yonhap reported. The news agency also quoted South Korean military officials saying North Korea conducted dozens of artillery firing drills Friday.